We’ve moved, just a little. 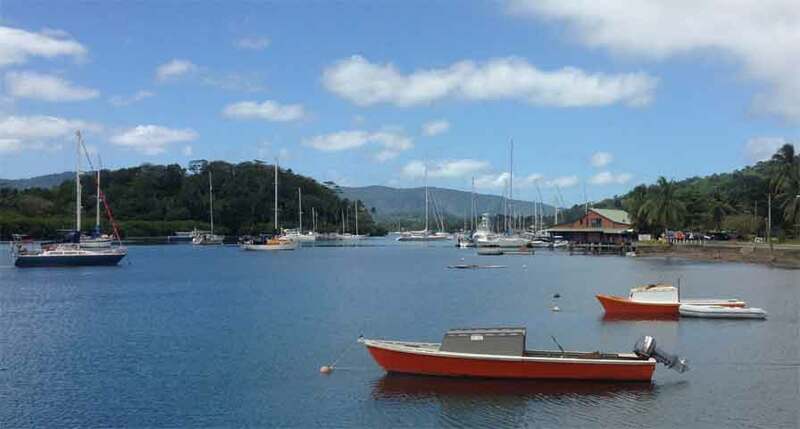 We moved to the Copra Shed Marina in Savusavu to clean the boat and load on final supplies. I took a taxi out to a friends container and picked up our old mainsail and old solar panels. We plan on donating them to a village in either New Cal or Vanuatu. We washed the boat checked the weather and boom. W/ came down with a sore thoat and a cough. That mess has been traveling through the community. So far I’d been spared. Till two days ago. We expected to move today. Heading towards Vuda and boat haul out, more maintenance then west. With both of us under the weather and no real time constraints we’re sitting tight. We prefer all systems to be 100% when we leave. That includes us. Hopefully this coming week we’ll again look to go. We had planned to clear Tonga by 7:30 am. We missed and it was closer to 8 when we had the anchor stowed and were motoring West out the pass. Once any of the islands were on our Easter quiadrent we set sail. We were far off the wind almost to a run and we only pulled out the Yankee Jib. Our speed was an awesome (not) 2+ knots. However the wind vane handled it well and we very slowly; slower than a walk, made way towards the Lau group 260 miles W of us. We hoped to arrive in 48 hours at the first waypoint but to do that we would ask for a wee bit more breeze. I had deployed two lines and we were making our way right through the middle of the school. Zing! Fish On. While I move to the reel with the fish W/ ‘s job was to crank the other lure back aboard avoiding tangled fishing lines. 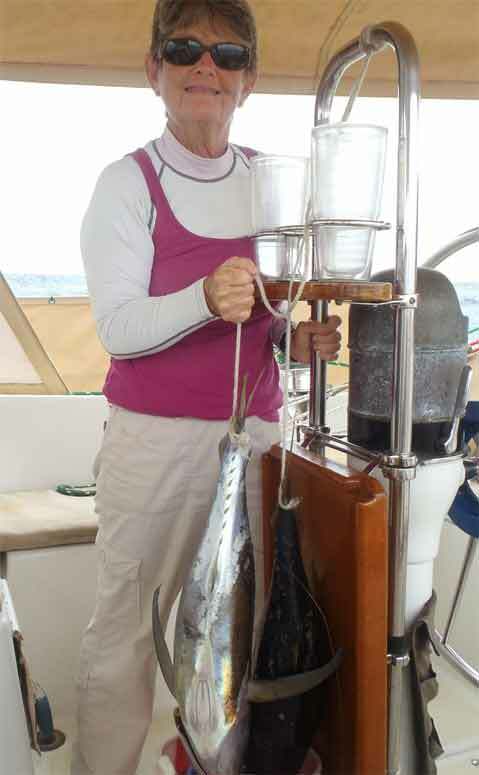 Before she could even clip in and begin to withdraw the other lure that reel zings too. Two fish! Ok. Set the drag so we don’t loose the line on either fish and take care of one at a time. As we’ve now two active rods W/ gets the fishing belt that where I can nestle the rod in and bring the fish aboard. Neither fish jumps which indicates Tuna. Tuna like to dive and stay deep. I crank away and soon the fish is up to the boat still trying to dive. I work it up to the side of the boat while W/ has a towel ready. One, Two, Three, Go! I swing the fish aboard and into the cockpit just as Dirk taught me. Once aboard we cover the fishes eyes and that seems to settle them down. We have plenty of strong line and leaders on the system and it easily handles the weight of the fish. Covered W/ places her feet on the fish reducing the blood and scales it would throw all over the boat. By the time I get the other fish to the boat fish one has calmed down a bit; died might be a better word and now I swing fish two aboard. We now have two fish flopping in the cockpit; one really flopping but the first one refuses to give up and every once in awhile he/she too give a few last minutes pushes. Next on the list hang them bleed them. I tie a noose around the tail of the first one as W/ has the second one under control-almost. 🙂 Once I have the tail secure I slit the gills on each side and hang it head down into a bucket. This bleeds the fish and gives it time for rigor mortis to set in. Once the fish is bled and firmed up cleaning / filleting will be much easier. Fish one is complete and I attach fish two going through the same routine. We hang them off the pedestal and tie the bucket so the fish will not swing like the pendulum on a clock. A bit of cleaning prepares the cockpit for our wait. I radio Common Crossing and let them know about the school, Half way through the conversation we lose the signal. That’s the limits of VHF. Oh well. I guess no more radio schedules with them. Before the Sun sets we have both fished cleaned and in the freezer. We have the cockpit cleaned up and the rest of the fish has gone back to feed the sea. Nothing goes to waste out here. We’re settle in for a pleasant evening. We’ve picked up speed and now are traveling 6-7 kts with only the Yankee Jib. Sweet. Our charting program; SeaIQ, informs us that at this speed we will arrive at the most critical way point about 7 am. So far, this trip is one of the few times our sailing has gone according to plans. I doubt we’ll maintain this speed for another 36 hours but one can only hope. As we settle in to our evening watches I check into the Pacific Seafarers net on 14,300. They are a group of Ham operators that assist with voyaging vessels as well as providing weather info to the various governments that use the data for improving their weather forecasts. We check in daily while offshore and report when we’ve arrived at our destination so they can close out the file. The net is for us a valuable service to keep us in contact with any needed support teams. For our personal support on ships systems we have two other cruisers that have helped ease my mind and we contact them via email. Neither of them have the ham setups for communicating 12,000 miles away. On the PacSeaNet there are 4-6 stations placed around the Pacific with directional antennas and often greater elevations such that we’re always able to have contact with one station via voice. I can’t stress enough the service they provide for the world wide meteorological community and cruisers anywhere in the Pacific. Our evening watch schedules have settled into 3 hours on- 3 hours off , 2 hours on-2 hours off. This gives each of us if we’re lucky about 5 hours sleep and during the day we can fill in as each desires. It also provides us with time to do our email for weather as the propagation for ham radio email is often best at dawn and dusk. We’ve found that favoring one over the other in our watch system could put us at risk. When we have an issue we both need to be as well rested as possible and it is dangerous for one to be fully alert and rested and the other to be only partially functional. 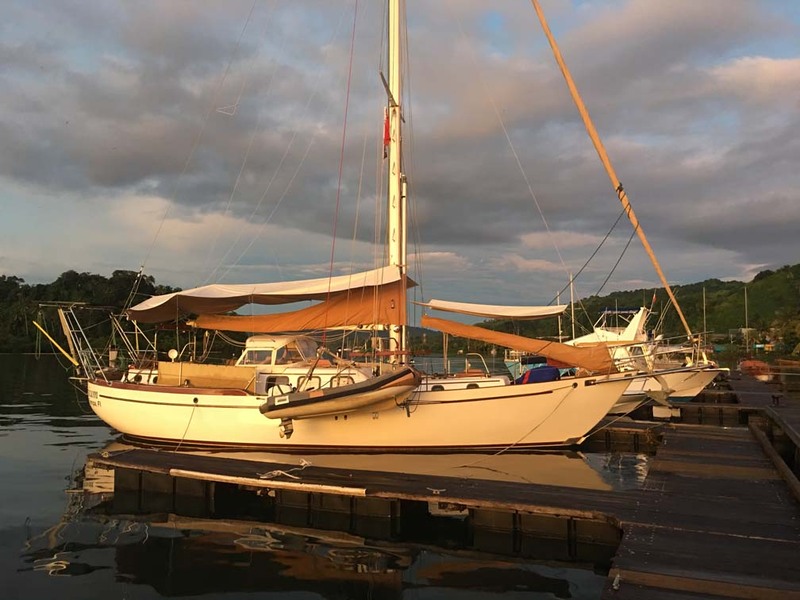 However; when we reach port we are always a little sleep deprived and both of us sleep like babies during the first one or two nights at our new anchorage. After midnight the winds ease a bit and we’re down again to the 4-5 kt range. Not horrible but not what I would have wished. However, I am glad we’re not down to 2 kts! Our charting program now indicates arriving at our first critical waypoint about 11 ish. That’s ok but I don’t want to be there much later as then we will have to cut out of the path and get to open water adding more miles to the trip; but, safety is the name of the game. Day two finds the seas rolling the boat some, I’m not fond of rolling and despise when the mast crosses the vertical. That is when we are at 10 degrees to port and then swing 5 degrees to starboard. We were hoping for some Sun but the day mostly teased us with a majority of clouds rolling overhead and few breaks. With our freezer full of fish we didn’t fish and with the boat roll I didn’t really feel like it. Today consisted of keeping the boat on course and moving. Our arrival time kept wavering between 7 and 11 am for making our first waypoint and with that we were quite happy. As the Sun passed over head the winds increased with the time and by early evening we were bouncing along at 6 kts. Like last night, the clouds started to break and we were going to have a star filled night sail. As I came upon watch I saw my first falling star in a long while. The following am we hoped to see the island in the Lau group, Fiji. And we did. Right on time. This voyage is about the first that our times and landfalls needed to match and did. We hit Manihi in the Tuamotues close to perfect and Rarotonga a little late but all of them worked out well. Here we came upon the islands in the early am and bingo, as long as the winds held we would be through them and enroute to clearing in to Savusavu, Fiji on Firday. make very little noise collapsing and refilling. Actually, as it is of lighter material it will rarely collapse. 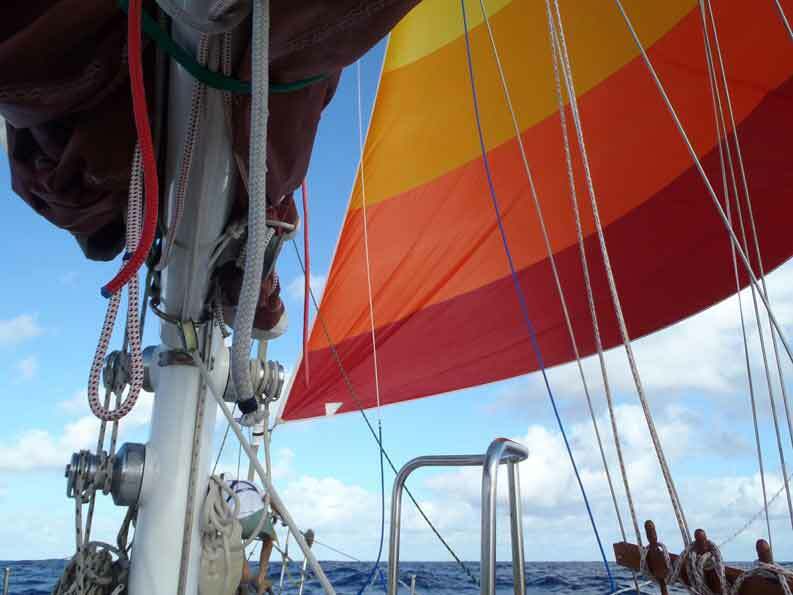 We fly the drifter free; meaning that the luff is not attached to the headstay. With the winds being slightly off the port quarter too we didn’t put the pole out. The pole does stabilize the sail but I jury rig some of the blocks to control the pole and for one day’s sail I wasn’t interested in all that work. Se free we are. the final approach.We contact Copra Shed Marina for details to complete the paper work needed for entry, and they assign us to a mooring that is occupied. Another simple call to them provides us with one closer to the Yacht Club and they inform the officials of our arrival. They will bring them to the boat when they are ready and we make some attempts to clean up the boat. Passages, no matter how easy they appear, take it out on the passengers and the yacht. Fortunately, with the officials being brought to the boat we didn’t need to rush and prepare the dinghy for use. We can do that in the am once we are well rested. For now, a few deep breaths, a bit of sustenance, a little patience, and we will be cleared in to….. Fiji! Yeah.